Dhankuta is a village located in Eastern part of Nepal and this type is made only in this village. People mostly use it as a decorative piece because of its elegant and delicate look therefore it is named as Dhankute decorative. The skilled craftsmen from the village make special scabbards from indian rosewood depicting national symbols and pride marks of Nepal such as Kings crown (Shree-pech), national bird (Danfe), national flower (Laligurans), national fish (Aasla), Gurkha insignia (khukuri cross, mark of a temple (Pashupati chaana), the holy sword (Trishul) etc. It is made very simple yet very attractive. 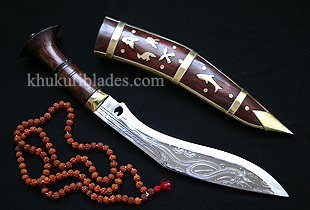 To add more beauty to this kukri, skilled craftsman has carved dragon on both side of the blade using only domestic tool.